Whether you are renting your first apartment, moving into your first home, or upgrading to a place with more square footage, furnishing the new place can be overwhelming when dealing with a tight budget that has already been stretched. Furniture certainly is one of the biggest cash expenditures in your home. And while quality tables, couches, and chairs can last for years, furnishing an entire room will typically cost far more than you planned on spending. Luckily, with a little patience, time, and dexterity, you can easily add great furniture pieces to your place with furniture that you’ll be sure to get good use out of for the next years to come. When moving into a new place, it is often difficult to be able to afford to furnish an entire room at one time. If this is the case, the best strategy is to start by only purchasing the furniture pieces that are most important. Then, as you can afford them, you can add more furniture pieces. When it comes to the most important pieces in each room, the bed is the most important piece in the master bedroom; in the living room, the couch is likely the first piece you will need. Once you have added the most important furniture pieces to each room you can start looking at purchasing the next important items, such as coffee tables, night stands, or dressers. Furniture stores will often offer discounts on last season’s models. This enables you to find stylish and modern furniture at great prices. You often can find matched sets of furniture on sale to receive a better discount on the whole set. Furniture stores that are selling last year’s design will generally have it priced lower than a single piece of brand new furniture. Waiting until the next season’s models come out can really save you some cash. Just because you are on a budget doesn’t mean you should give up style. In order to keep your home modern and contemporary, shop for furniture that shares a similar aesthetic. Contemporary furniture is typically less expensive because it has less embellishment than more traditional or antique furniture. Some people are hesitant to buy used furniture — we get it, not knowing where it came from causes concern. However, not all used furniture stores are the same. 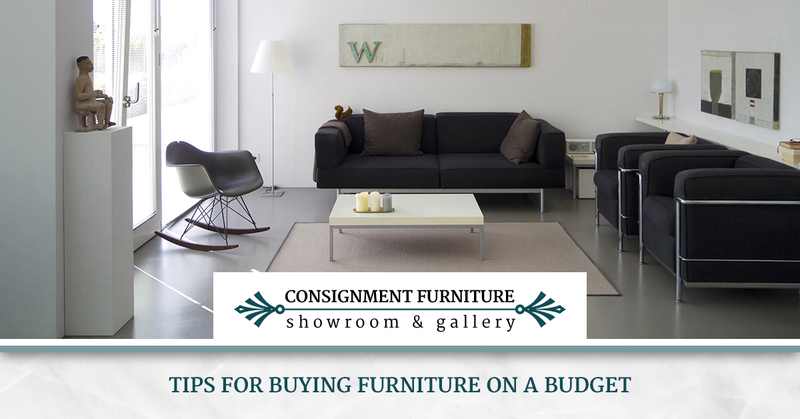 Consignment furniture stores, for example, sell gently-used and quality furniture pieces. A reputable consignment store will only sell clean and quality pieces that are in good condition at a budget-friendly price. With time, patience, ingenuity, and following these four tips, you can find great pieces of furniture at a low price. If you are interested in checking out a consignment furniture store in Clearwater or St. Petersburg, Florida, visit Consignment Furniture Showroom & Gallery. Our 8,000-square-feet furniture stores carry a wide selection of furniture pieces perfect for your home. To learn more about our available furniture pieces, check out our online inventory! If you have any questions, please do not hesitate to contact us!